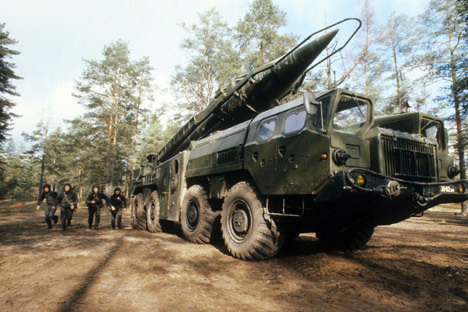 The Soviet R-17, better known as the Scud missile, has figured in the arsenals of over 30 countries, and became a household name during the first Gulf War in 1991. No other ballistic missile has seen more action in the conflicts of the 20th and 21st centuries as the Soviet R-17. Globally known as the Scud, it has been copied and modernized beyond recognition. Around 3,000 of these short-range missiles are thought to have been fired in anger in world conflicts over the last half a century. Due to its simplicity, reliability and low cost, the R-17 has figured in the arsenals of more than 30 countries and been widely manufactured under license or simply copied. The R-17 was tested fired in 1957 after two years of development, and was intended to replace the R-11 first generation of Soviet tactical nuclear missiles. These in turn were derived from the Nazi-built V2, the world’s first ballistic missile, more than 1,300 of which were fired upon London in WWII. Through the use of improved fuel the R-17, unlike the R-11, kept its edge for more than 20 years while not needing highly skilled maintenance. This and other innovations helped to achieve the 186-mile maximum range of its first modification while being smaller and lighter than the R-11. It carried explosive or nuclear warheads and could hit a target within a 656-yard diameter at full range. The nuclear-armed variant was the main weapon of the Soviet rocket forces, while the conventionally armed units were generally exported. From the 1960s to the 1980s, Scud missiles were shipped in large numbers to the Soviet Union’s international partners and recipients of military assistance: Around 1,000 missiles were sold to countries including Egypt, Iraq, North Korea, Cuba, Vietnam, Libya, and Syria. Many began unilateral production by buying the license and simply copying the weapon. North Korea in 1984 began producing its equivalent, the Hwasong-5, hundreds of which were exported to third countries including the United Arab Emirates, Libya, Egypt and Pakistan, which in turn produced their own versions of the missile. In 1987, Iraq perfected production of the R-17 as the Al-Hussein missile, which had a greater range through a reduced payload. Baghdad also sold on the technology, in particular to Brazil, which in 1988 began turning out the missile as the S-300. One offshoot of the Iraqi Scud program was the modification of the missile to launch 330 lb satellites into space. Iraqi engineers used an elongated, two-stage version of the Scud, around which were installed four accelerators comprising R-17-based rocket engines. On December 5, 1989, Iraq’s first space carrier blasted off from the Al Anbar launch site 140 miles southwest of Baghdad. It climbed 15.5 miles before blowing up 45 seconds into the flight. The program was then interrupted by the outbreak of the first Gulf War. Among the Scud’s other clones and incarnations was an Egyptian modification that was first used in the Yom Kippur War in October 1973, fired at Israeli forces at one of the crossings of the Suez Canal. Only seven Israeli troops were killed but the very fact of Egyptian ballistic missiles being used proved an effective deterrent, since they posed a threat to strategic targets in the rear, cities included. This prospect made the Israelis more inclined to agree on a ceasefire. During the 1979-1989 war in Afghanistan the Soviets also used R-17s against mujahideen forces dug into well-protected positions in mountain gorges. Because of the varying precision of the weapon, it was fired in clusters and usually from no more than 30 miles away – effectively a ‘close-range’ shot for such a heavy weapon. The ensuing effective destruction was more the result of ignited unused fuel than the blast and fragmentation of the 2,180 lb explosive warhead. Enemy positions were doused and invariably obliterated with 160 gallons of kerosene and over 2 tons of concentrated nitric acid. Around 1,000 missiles were fired during the conflict. During the so-called "war of cities" during the Iran-Iraq conflict of 1980-1988, both sides used Scuds against the other’s population centers, firing a total of around 600 missiles. By the end of hostilities the infrastructure and cities of Iran’s Khuzestan province had been almost completely destroyed. Iraq also suffered severe destruction from the missiles, including in the capital Baghdad. The R-17 was also heavily used during the first Gulf War in 1991. Iraq fired 40 missiles into Israeli territory and another 46 at Saudi Arabia. Fortunately for the civilian population these fell in sparsely populated areas and casualties were minimal. In Israel, two people died and 11 were wounded. But one Scud hit a U.S. military barracks in the Saudi city of Dhahran, claiming the lives of at least 26 American soldiers and wounding almost 100. It was the greatest loss of coalition forces in one day during Operation Desert Storm. Meanwhile, U.S.-built Patriot surface-to-air missiles successfully intercepted only 20 percent of the Scuds, despite their broad deployment. In one incident, 26 Patriots failed to down one R-17, an extremely favorable balance for the Iraqis since one Patriot costs three times as much as a Scud. The Scud and its many spin-offs are still in service around the world today. In terms of price, simplicity and reliability, the R-17 remains unchallenged, and adaptation and domestic production is realistic for countries that previously lacked the necessary technology and manufacturing base for such a complex weapon. And the Scud may have earned its place in over decades of global conflict as the “Kalashnikov of ballistic missiles”.